Usually reserved for bold European designs, the Exo Apartments in Reston, Virginia boast a facade clad entirely of aluminum composite. 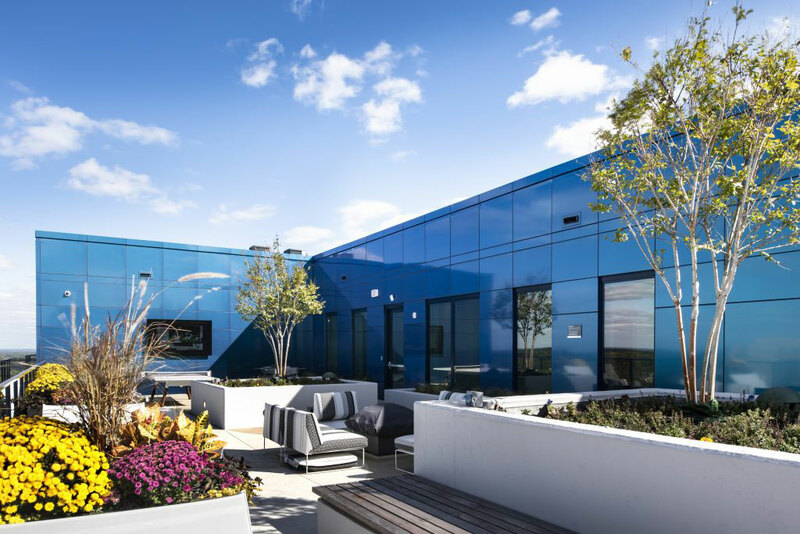 The iridescent exterior is enveloped in ALUCOBOND Spectra Ocean, a color-shifting finish which features a LUMIFLON FEVE resin topcoat. Interestingly, the façade has more than one adaptive cladding material, the building also utilizes smart glass technology that changes severity of window tint to optimize natural daylight penetration. The Exo Apartments, just 25 miles outside of Washington, DC, encourage their tenants to “live in full color,” clearly a nod to their colorful design. 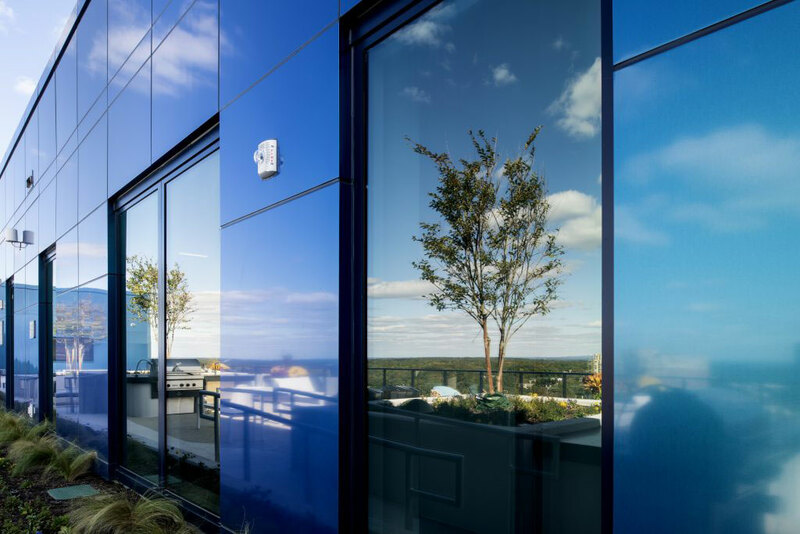 Designed by R2L:Architects, the building is the “first multi-family residential community in the United States to feature View Dynamic Glass,” representatives at ALUCOBOND explain. The over 450-unit, multi-family residential community features two identical 16-story towers, connected by single-story reception area. The luxury apartments feature the latest technological advancements to adhere to the growing demands of the urban commuter. The windows, for example, utilize smart technology to adjust their tint to remove glare, optimize natural light, reject heat influx, all available from your smart phone app. The kaleidoscopic exterior changes based on focal viewpoint, natural and artificial light. Manipulating light and shadow to variate shades of blue and provide a unique perspective to each passerby. 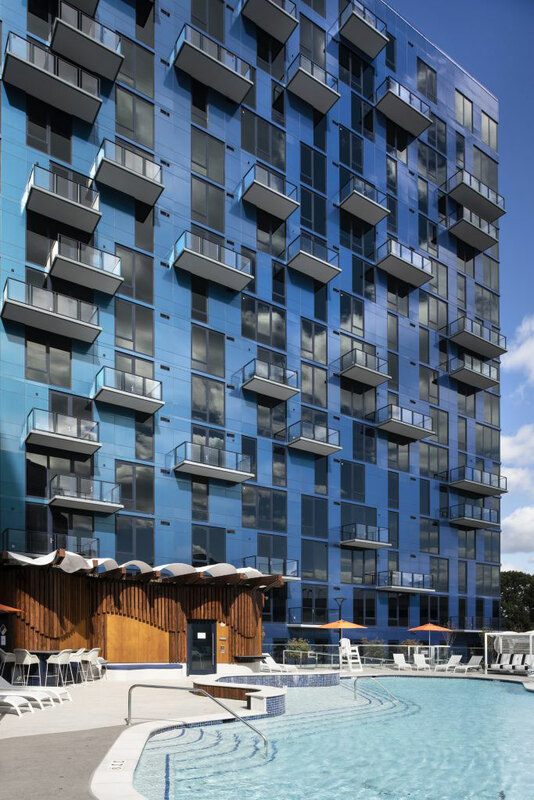 The shifting hues are due to a high-performance coating system that was finished with a Lumiflon-based topcoat. When applied to an architectural surface, coatings that utilize Lumiflon FEVE resin technology protect the structure from UV radiation, salt, water, and other elemental deterrents that contribute to coating degradation. The coatings also contain color and gloss retention properties, which helps prevent fading and chalking. ©2017 Asahi Glass Company. All Rights Reserved.